The typeface offers numerous combination possibilities between the basic glyph set and stylistic sets.The stylistic sets are alternate alphabets that you can access by using OpenType savvy programs such as Adobe Illustrator, CorelDraw and Adobe InDesign. Do not use any third party software that does not support the OTF (Open Type Format) feature. File size is approx 227KB (365KB unzipped), offered as a single download. I needed the crafters version of this font for my Silhouette Cameo, but after reading the comments, I read that this version was at least compatible with Inkscape, so I decided to buy. However, I have tried several times and cannot get the glyphs to work with either Inkscape or the system’s character map. Very disappointed that this version of the font is only compatible with expensive graphics programs. I am so sorry to hear that you are having trouble with this! Rest assured, we are always here to help if you are having trouble with anything you’ve purchased and we always offer a full refund within 30days of your order too if you are unhappy, so please do pop us over an email on hello@designcuts.com and we can certainly help. Do you have access to the new updated PUA encoded crafter version of the font? or do I have to contact the designer and show an invoice and such to get the update? Thanks, that would be a useful option to have. Thank you so much for coming back to me Joseph and I hope that we are able to include this one in future for you. Can I use this license that is included to make SVGs to sell? I’m so sorry for any confusion caused by our licensing, rest assured I have popped you over an email to help! Wallington is my new favorite! Love, love, love this font! 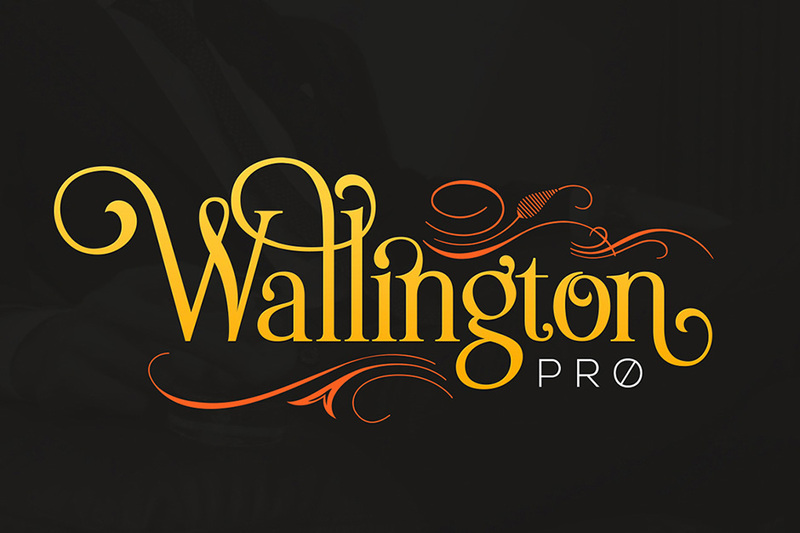 Hey Ashley, I’m so sorry for any confusion caused trying to locate these individual swirls that the designer has used in their preview graphics for Wallington Pro, unfortunately these are not included in tis particular font pack so our sincerest apologies for any disappointment caused! I would be more than happy to help you find stand alone ornaments for your resource collection if you would like any assistance at all with this Ashley, so I have popped you an email to help! The great news is, fonts can literally be used in all types of text and design based programmes once they have been installed onto your computer 🙂 it unfortunately doesn’t come with any instructions, however if you get stuck, please don’t hesitate to pop us over an email. Thanks, SJ! I’d bought it… these alternatives are sooo NEW to me (not a fan of Photoshop😋), they are FUN.🙃 Would you please help me with finding the ornaments, please? Looking forward to an📨 (take your time, not particularly hurried😊). Thank you so much for coming back to SJ and we’re so thrilled to hear that you really like this one. We’re so glad to hear that you are really enjoying celebrating our birthday with us, your support really means the world to us! Is this allowed to be used as a title font on a ebook? Thank you so much for your comment and rest assured I have popped you an email to help! The Swishes and Swashes seen in their name/log ARE available in this, right? So the swishes/ swashes are definitely available but you will need either AI or PS to access them as they are located in the Glyphs/ Character panel! I hope that helps but do let me know if you need any help! Will it work with maintype character map? Please note however that Stylistic Alternates will require professional design software such as Adobe Illustrator, Photoshop, InDesign or Inkscape. It would appear that this is desktop only. Is there a webfont available at extra cost please? Thank you for your comment, I’m really sorry to be the bearer of bad news but I’m afraid that we would not be able to provide the web font version for this font. I apologise for any inconvenience caused but if you have any other queries please do let me know. I’m always happy to help! In the title picture it shows a lowercase letter set. Is Wallington pro only uppercase or does it have lowercase also? Thank you for your comment! I can certainly help you out with this query 🙂 I’m happy to confirm that Wallington Pro does feature lowercase and uppercase characters but I should mention that the also featured Wallington SC only has uppercase characters. I hope this helps, Jason, and please don’t hesitate to contact me should you have any other questions. I’m always happy to help! Just wanted to clearify something: the fonts will change automatically depending on the letters combination.. If you do need assistance with getting up and running with it, please do let me know and I will happily lend a hand!